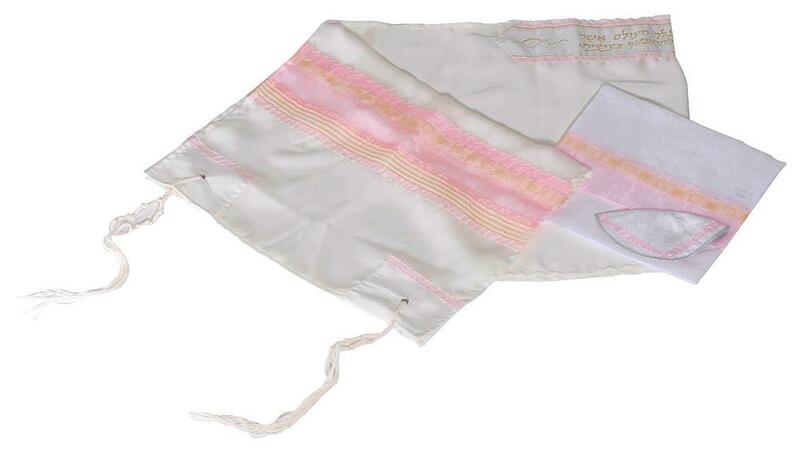 This is a nicely adorned silk tallit set for women hand made in Israel, which uses pink and gold as chromatic motifs. 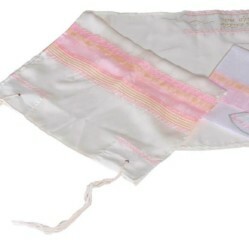 An exquisite combination of pink solid stripes and yellow thin repetitive laces on a pure white background makes this feminine tallit set a unique piece of the Israeli religious clothing design. The symbol of the purest form of faith or of the divine light, gold is a powerful chromatic tone to be used on prayer shawls. The unusual combination with pink provides an even more feminine look to this tallit set which contains a shawl, a bag and a kippa. Named after the saint capital of the Jewish country, this highly elegant tallit set is made of 100% pure wool and hand made in Israel. This tallit set has been especially created to be worn on unique occasions such as wedding or Bar Mitzvah ceremonies. The sober elegance of this woolen tallit set makes it perfectly suitable for the weekly Shabat prayers. TallitShawl.com is the place to buy hand made tallit prayer shawl.